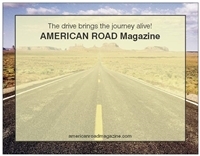 Stay in touch with friends you meet on your travels with these American Road® flat note cards. Makes a great gift for the two-lane traveler. Set of eight cards with envelopes. Dimensions 5.47 x 4.21. Paper Stock: Premium, 80 lb. card stock. Matte finish. The American Road® 600 Denier Polyester waterproof tote bag comes in handy everyday for shopping, books, and work. This attractive hand-embroidered tote is also great for packing snacks to take on your next road trip!